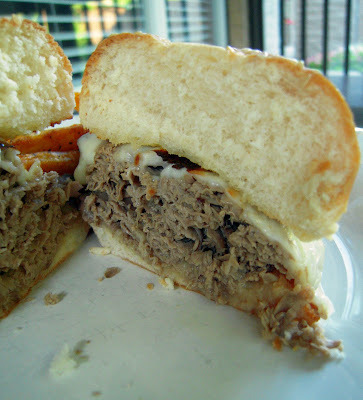 Easy French Dip Sandwiches - deli roast beef, homemade au jus, provolone and hoagie buns - SO good! Ready in 10 minutes. Great weeknight meal! 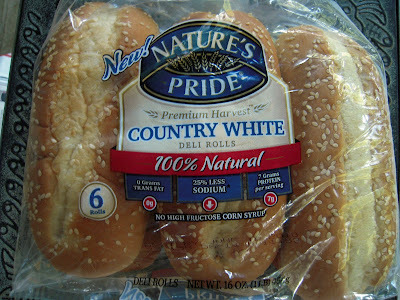 This month's Tastemaker Program from Foodbuzz.com was bread from Nature's Pride. We received deli rolls and two different sandwich/burger buns. I decided to make French Dip Sandwiches on the deli rolls. I love a good french dip from a steak house, and these french dip sandwiches rivaled any that I've had in a restaurant. The best part about these sandwiches is that they only take about 10 minutes to throw together! Can't beat that!! Preheat oven to 350ºF. Open the hoagie rolls and lay out on a baking sheet. Combine melted butter and 1/2 tsp garlic powder and brush on hoagie rolls. Heat beef consomme, water and garlic powder in a medium saucepan over medium-high heat to make a rich beef broth. Place the roast beef in the broth and warm for 3 minutes. Arrange the meat on the hoagie rolls and top each roll with 2 slices of provolone. Bake the sandwiches in the preheated oven for 5 minutes, or until the cheese just begins to melt. Serve the sandwiches with small bowls of the warm broth for dipping. That sandwich looks delicious - I'm a big fan of them but never think to make one. 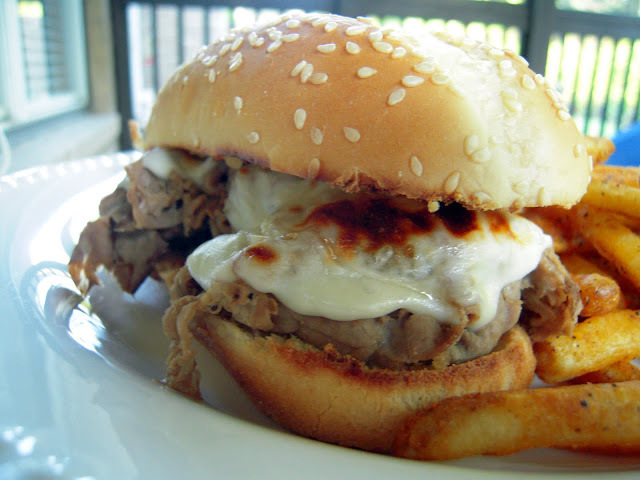 I've actually been wanting to make french dip sandwiches! Thanks for the reminder. I'll most definitely use this recipe. I love french dip and it's such a quick meal during the week. I'm adding it to my menu for next week. French dip are one of my favorites. I tend to order them more than anything else. Looks yummy and I like the quick/easy recipe. I LOVE French dip sammies. We do roast beef po'boys around here mostly so FDs get a bit pushed around LOL! I need to make some! 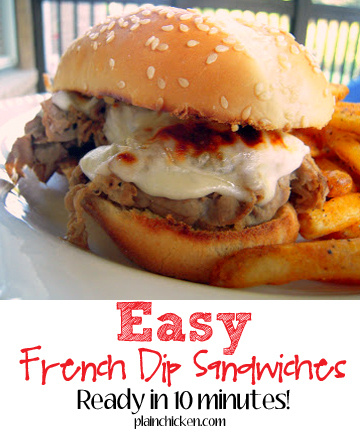 Love French Dips and I've never made one - how silly is that?? I'm going to try this one. any preference on what brand of roast beef? Leah - so glad you liked it!